This entry was posted on March 1, 2016 by Sew Essential. This week we're pleased to bring you the second post in our 'Essential Patchwork and Quilting Toolkit' series written by our lovely resident patchwork and quilting guru Joan! Joan gives us hints and tips for choosing the right tools for the job - perfect for those new to patchwork and quilting, but also a good opportunity to review all the options for a more experienced hobbyist. Last week Joan covered pins, needles, thread, fabric markers and thimbles and this week it's all about cutting equipment, cutting boards, rulers and templates. Over to you Joan! Rotary Cutters are available in a variety of shapes and sizes, and generally the choice is all down to personal preference. Having said that, make sure the rotary cutter you choose has blades readily available because it can be difficult to find compatible blades for a very cheap rotary cutter. Ideally stick to a well known brand such as Olfa, Fiskars, Sew Easy or Clover. Rotary cutters are extremely useful but dangerous tools and care must be taken to ensure that the blades are not left exposed. I don't know of a quilter who hasn't cut themselves, with varying degrees of severity at one time or another! Two examples of cutters whose blades have a safety feature are the Olfa RTY-2_DX and the Olfa RTY-2_G . Both of the examples shown are available in a 60mm as well as the 45mm and in the case of the first one, there is also a 28mm option. In the second picture (Olfa RTY-2 G) you will see that there is a black circle beneath the blade and this is designed to cover the blade when not in use. The user simply pushes up the black slider positioned beneath the blade and this then shields the blade to prevent accidental cutting of the user. Sounds easy, but whenever I've used them I've found it impractical to push the slider up after every cut whilst fabric is repositioned (or I'm just too lazy!) and this almost always results in me putting the cutter down, then reaching for it and finding the blade first! It then takes longer to complete the task as a first aid kit has to be sought and a clean up of the area and sometimes fabric has to follow! It is surprising how profusely even little nicks from these cutters can bleed – believe me I know! For the reasons above, the only type of rotary cutter that I would ever buy are the first option (Olfa RTY-2 DX), as these are far safer. With this type of cutter, the blade is never exposed unless you squeeze the handle, hold it together, and then press the red button as this will lock the blade open. I'm sure someone somewhere has probably done this, but I can't think of a good reason why anyone would. When the handle is not being squeezed together, if the red button is pressed it will lock the blade in the safe position, which is an excellent feature to ensure that it cannot accidentally be exposed in workboxes or bags. 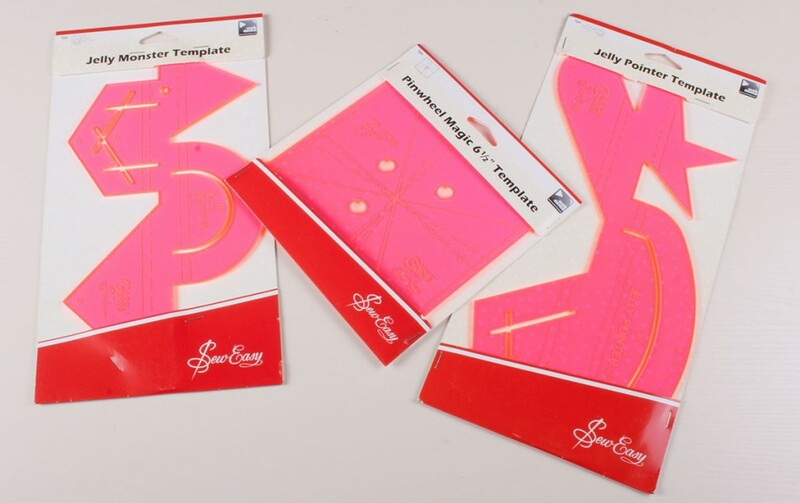 As for the size of rotary cutter the 45mm is a good starting point for a beginner and as you get more into quilting you may find that you prefer to have a range of sizes to use for different sized projects. 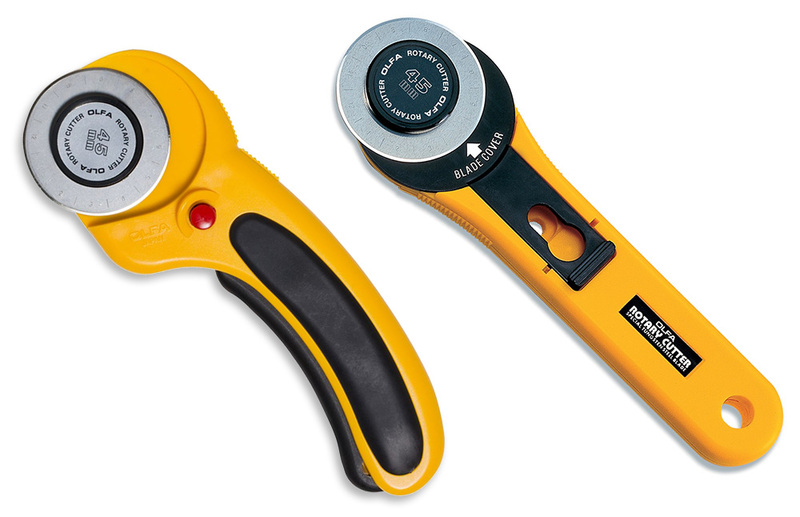 Another type of rotary cutter, which is relatively new to the market, are the ergonomically designed ones designed to reduce stress on the wrist. I myself have not really used these enough to decide what my feelings are, but I have spoken to several quilters about them and it would appear that they're a bit like Marmite - you either love them or hate them! These cutters have a range of rulers especially designed to use with them, with a track that the guide slots into. It is better for both your patience and your cutting mat to ensure that you always use a sharp rotary cutter blade when cutting your fabric. A dull blade will damage your board and probably make your wrists and hands ache since you have to push down harder. It also won't give a very clean cut and you may find that you are having to run the blade along the ruler again, or finish the missed bits with scissors. This can be time consuming, boring and frustrating - urgh! It can also pull the threads in the fabric. If you are going to use your rotary cutter to cut out templates or to cut wadding it is worth saving your old blades for this purpose. Both paper and wadding will dull your blades quite quickly so you won't want to use your nice sharp ones. All quilters, myself included, are guilty at times of trying to struggle on with a blunt blade, but we all know that it really isn't worth it. I think the reason we do this is that we would rather save the money for more fabric if the truth be known because you can never have enough of that can you! When changing a blade take care to check which way round any washers fit as you take the cutter apart. This will ensure you can fit it back together properly first time rather than having to take it apart again increasing your chances of cutting yourself. It is a good idea to dispose of old blades in the plastic containers that they arrive in or failing that wrap some packaging around the blade and seal with tape before disposal. Whilst I believe that there are several methods of sharpening rotary cutter blades the only one that I have ever used myself is a TrueCut rotary blade sharpener. With this type of sharpener you insert the rotary cutter blade and move it in a cutting motion, backwards and forwards about 20 times - easy peasy! A sharpener will never make a blade as sharp as new, but it will extend the life of it. Self healing mats or cutting boards as they are often called are the most expensive item in a quilters kit apart from a sewing machine. For this reason it is important to choose the one that will suit your needs best, although as you become more enthusiastic about quilting you will probably find it necessary to have more than one size. When first starting it is probably best to purchase the 24" x 36” size, as these are easier to store and take to classes, but large enough for you to only have to fold the fabric once. Once your quilting obsession starts to grow in strength and magnitude you might choose to also have a larger mat for cutting fabric at home and a smaller one for miniature work or other small jobs. Always check where your board begins and ends as it is all too easy when your fabric is covering it, to go off the edge of the board and into the surface beneath! Watch out antique dining table your number could be up! Heat will warp your precious cutting board so never leave one it in direct sunlight, even in the winter, and never leave it close to a radiator. The markings on mats can vary and not always match up with each other if using different brands. For this reason, use the markings as a guide only and use the ruler rather than the mat to actually measure with. There are also rotating mats on the market designed to reduce moving either your fabric or your body around the mat too often. These are very useful for those of us who cut out on the floor, not ideal, but unfortunately sometimes necessary. There are many different brands of mat on the market, but some are better than others. Personally, I prefer the thicker mats as they seem to last longer and 'heal' better. Some mats are also double sided, and can have inches one one side and metric markings on the other, whilst others can have the same markings on both sides. I personally work in inches, as do most other patchworkers and quilters that I know. Traditionally, patchwork uses the imperial system so a totally metric mat would not be my choice, and I would always go for one with inches on both sides. On the subject of lasting longer, like everything else, cutting boards will last longer if they are properly looked after. Correct storage and cleaning will preserve the life of the mats as will the use of sharp rotary cutter blades rather than dull, blunt ones, and rotating or turning over the mat occasionally to ensure even use will also help. Never use craft knives or other blades as these will do real damage. Washing your mat occasionally is a very good idea. Lie it flat in a container filled with warm soapy water (not hot or it will warp) and removing any loose threads which have become trapped will keep your mat in good condition. You can use a lint brush or, for threads that just won't budge, a soft sponge usually helps with the cleaning process. Do not use the side of the board that you use for your fabric to cut wadding or you will be faced with a real cleaning job and nobody wants that! A lot of quilters either have an old board for wadding or use the reverse side of their normal mat. As most of the cutting is done with a rotary cutter, all that is really needed are 3 pairs of scissors, one small pair for intricate work and for thread trimming, a larger pair for cutting applique shapes (or a special pair of applique scissors), and a dedicated pair of scissors for cutting paper. Paper cutting can blunt scissors very quickly, so it is advisable not to use your fabric scissors for the purpose. 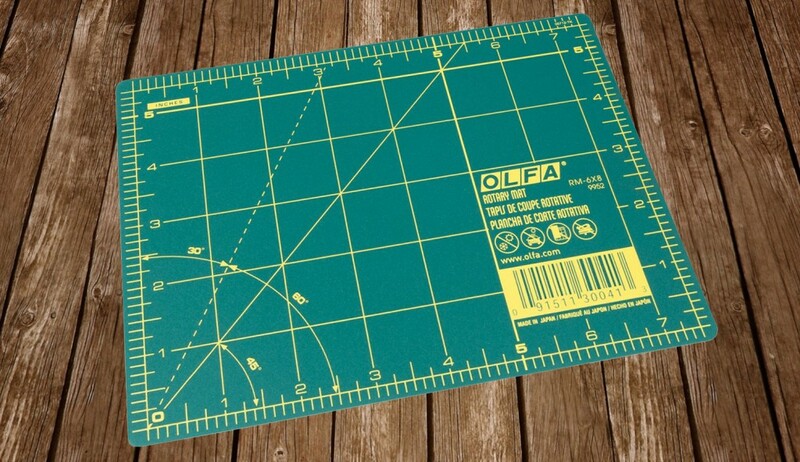 When using rotary cutters and mats you will need some form of ruler or template and there are a wide variety of both of these to choose from. When starting patchwork, it is sensible to start with a few basic shapes and then add to your collection as the need arises. A good starting point with rulers are the 24 1/2 " x 6 1/2 " ruler, and a 12 1/2" or 15 1/2" square, as these will give you the tools to cut strips and also to square up your blocks when completed. Some rulers already have non-slip markers built into the design, whilst there are non-slip stickers available to put on ones that do not have this feature. The markings on the rulers can vary between brands, but they all have at least marks at 1/4" or 1/8" intervals to use for measuring when cutting your fabric. Some rulers will also have other markings such as various degree angles. Always measure accurately to ensure that the pieces all fit, taking care to remember to add on seam allowances, the general rule is measure twice, cut once! Most quilters at some time or another measure and therefore cut incorrectly and find themselves with the dilemma of joining pieces or buying more fabric as a result, which can prove costly and sometimes make you want to cry! 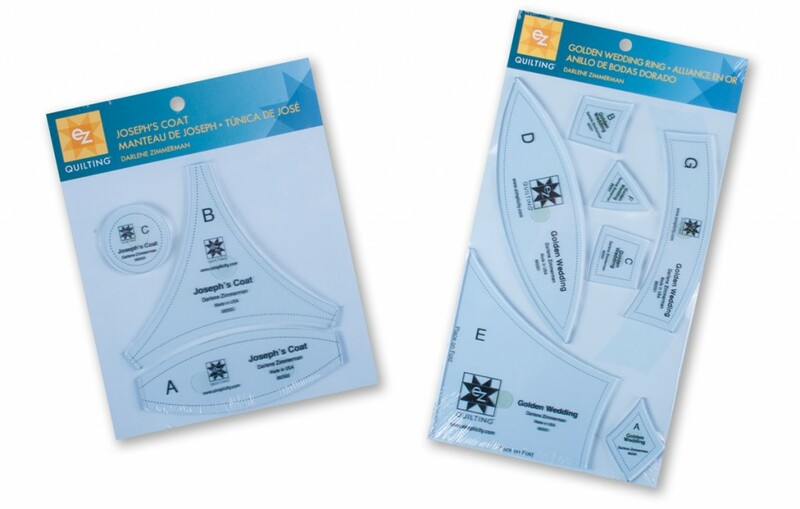 Templates also come in a variety of shapes, such as a very basic template sheet for cutting shapes, such as hexagons, in a variety of sizes, these are intended to be used to draw the outline of the shape onto the fabric or onto template plastic. For example, the above centre template is placed on the fabric in various ways when a basic 4 square block has been made to make more cuts enabling you to create one of 3 different quilt designs. Below are examples of template sets that contain all the components to make a quilt in a certain design. These have seam allowances added into their design and are made from hard plastic. They are an excellent tool for producing the quilts they are designed for and in some cases even give the fabric requirements. I hope my pearls of wisdom have been useful for you and will follow up with the final instalment in the next few weeks. Follow us on Facebook and Twitter for news, tutorials, special offers, sales and more.